Reduced NO production rapidly aggravates renal function through the NF-κB/ET-1/ETA receptor pathway in DOCA-salt-induced hypertensive rats. Macitentan, a dual ET receptor antagonist, prevents nephropathy in type 2 diabetes. Characterisation of Endothelin-1 binding sites in colorectal cancer and antagonistic action of the Endothelin A receptor antagonist Zibotentan (ZD4054). 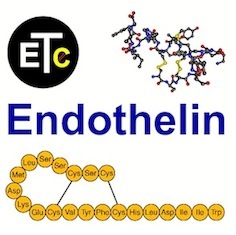 Endothelin-induced astrocytic amyloid production: A neurovascular culprit in the pathogenesis of Alzheimer's disease?